New item is "Military grade" Berry Amendment Compliant extra durable 40 denier no-see-um netting 64" wide is now available in black, olive, slate grey, tan and natural non-dyed off-color, made in USA. Specifications meet US goverment and military requirements. Custom color sand widths are available upon request for fabric mesh purchases of 5,000 yards. SKEETA high quality, durable, yet light-weight mosquito netting, no-see-um netting, camo no-see-um netting offers effective protection from insects and bugs. The perfect insect mesh provides insect protection and insect control while in your yard, garden, patio, camping, fishing, hiking and outdoor travel. SKEETA sells fabric mesh netting by the yard or in pre-packaged lengths of 5 yards and 10 yards, or netting by the roll. Our 66" wide mosquito netting is available in colors black, white, beige and ivory, 72" wide mosquito netting is available in colors black, white and sand, our 54" wide ultra-fine no-see-um netting is available in colors black, white, slate, olive and tan. Durable vinyl coated polyester mesh, waterproof with a high resistance to mildew, dirt, oil, salt, chemicals and UV. Superscreen with an outstanding strength and quality. Doesnt tear, stretch or crack. Can be sewn or glued together. Used as an all purpose screening, barrier, pool covers, garden mesh, marine covers, etc. Create a luxurious look in your bedroom and protect yourself from insect bites with SKEETA mosquito net bed canopies. SKEETA offers durable, polyester mosquito mesh bed canopies that are pleasing to the eye and functional mosquito control. Whether you choose a single point style insect net with a ring or four corner suspension insect net, you'll sleep well knowing SKEETA's got you covered. Get equipped with SKEETA bug suits! 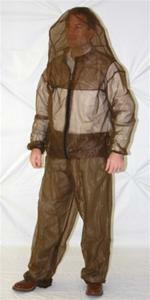 Provide complete coverage for your loved ones with a SKEETA bug suit that keeps insects away from their skin. Offered in a variety of mosquito suit sizes including children's, SKEETA bug suits cover you and your family from head to toe with extra-long sleeves and pants legs, and a uniquely designed hood that rolls down as a collar. SKEETA bug suits have a front pouch that reverses to fold jacket inside with pants, and includes a belt and buckle to secure around your waist, making SKEETA bug suits the perfect choice for all of your outdoor activities. SKEETA net tents are United States Department of Defense (DoD) issued Military insect net equipment! Protect your loved ones from biting and stinging vectors with the SKEETA net tents that are helping to keep safe those brave women and men who are dedicated to protecting US! SKEETA offers a variety of other brand insect netting net tents as well, to accommodate you. Let SKEETA build your custom sewing project for you. SKEETA offers complimentary design suggestions to help you realize your project big or small. You may want a mosquito screen to keep bugs out of your patio with mosquito net curtains or insect control to keep bugs in a no-see-um net cage for entomology research, or any other possible custom sewing project utilizing SKEETA's versatile fabric mesh. SKEETA offers other insect mesh and garden netting products and is continually researching and developing new ones. Let SKEETA help you locate insect mesh and netting or develop the insect screen you need for no-see-um and mosquito protection so you can "Get Equipped"! SKEETA THUG BUGS are Insect Action Figures that are taking on the world by swarm - so get your original first edition collectible stickers today! NOTE: Please let us know if you are skilled in cartoon character development or animation and would like to participate in the creation of the SKEETA THUG BUGS story! SKEETA, headquartered in Bradenton, Florida, USA sells mosquito netting and no-see-um netting insect protection products including fabric mesh netting by the yard, bed canopies, bug suits, net tents and custom sewing for outdoor enthusiasts who enjoy camping, fishing, hiking, and travel. SKEETA is a USA based manufacturing and distribution company for mosquito netting and no-see-um netting insect protection products, designed to protect against insect bites and insect stings. SKEETA products are an effective defense against insect vectors including the mosquito, no-see-um, spider, bee, ant, tick, gnat, midge, black fly, sand fly, and many others. 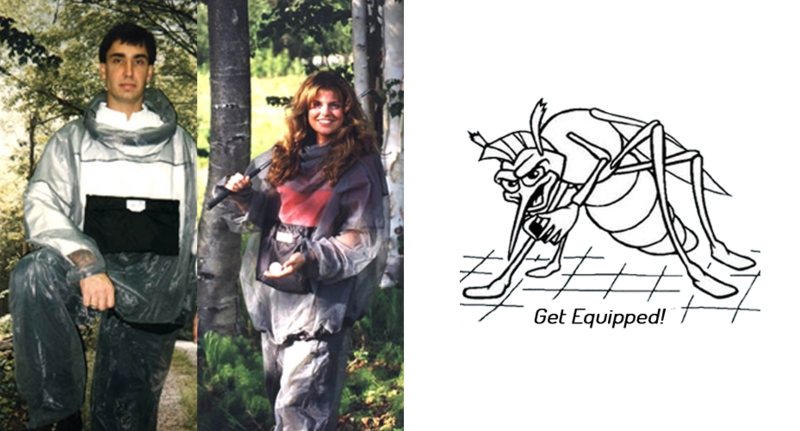 David E. Ways founded SKEETA in Fairbanks, Alaska in 1991 for providing chemical-free protection against swarms of mosquitoes in "the last frontier". Initially jackets, pants, and shawls were designed and produced, successfully field-tested, and sold at outfitting stores throughout the state. SKEETA has since developed new products including 240,000 SKEETA net tents that were provided to the United States Armed Forces in 2004 to protect our brave women and men from the sand fly that transmits the infectious disease leishmaniasis (causing "Baghdad boils") in the deserts of the Middle East. In 2011, SKEETA was awarded United States Patent No. 7,921,863 for the Self-Supporting, High-Profile, Insect Net Enclosure (a.k.a. the SKEETA Bednet). Designed and developed initially as "The Ultimate Bednet" for the U.S. Armed Forces, the SKEETA bednet will soon be available to commercial markets. Check-out our home-made Youtube video to "Get on the Shelf" at Walmart: http://www.youtube.com/watch?v=3nuvV4Saeuw. Insect vectors can transmit many serious and potentially deadly infectious diseases such as: lyme disease, west Nile virus, malaria, dengue fever, leishmaniasis, and others, as well as have toxic venom. SKEETA has grown over the years and is now distributing insect protection products manufactured by other companies, including bed canopies, bug suits and net tents. SKEETA is now selling Berry Amendment Compliant no-see-um netting which is required to be 100% domestically manafactured. Berry Amendment is a piece of legislation that requires the Department of Defense (DoD) to give preference to purchasing domestic, or home-grown products, like fabrics, foods, clothing, metal. This Amendment helps the clothing and textile companies in the U.S. to prosper. SKEETA's mission is to become the leading distributor of high quality insect protection products worldwide! 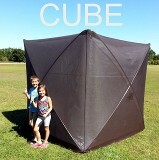 Innovative and Novel Extreme Net Tent! All orders ship within 2-3 days upon the receipt of the payment via your choice of delivery. Priority mail in the US usually takes 2-3 days to arrive standard, but timing is not guaranteed by the USPS. Express mail and FedEx shipment is available. Please note that shipping charges on the web are for USA destinations only. Additional charge will apply for shipping overseas via airmail post. Contact SKEETA about insect protection products, including fabric mesh, bed canopies, bug suits, net tents, custom sewing and others. Insect protection from the mosquito, no-see-um, spider, bee, ant, tick, wasp, gnat, midge, black fly, sand fly, and other insects, while in your yard, garden, patio, camping, fishing, hiking, and outdoor travel. Images and content on this website are the Intellectual Property (I.P.) of SKEETA, Inc. and may not be reproduced in any media without prior written consent.